Step Functions have been around since it was announced at re:Invent 2016. According to the AWS docs : AWS Step Functions is a web service that enables you to coordinate the components of distributed applications and micro-services using visual workflows. Step Functions are based on concept of Tasks, States and State Machine. All the work is done by the Tasks. A Task can be a Lambda Function, an Activity which can be fulfilled on other AWS hosted resources or even an Activity defined on our own machines. The State Machine is the flow in which we want to execute our tasks to complete the required process. It is the biggest component of Step Functions. A State Machine can be defined by JSON written in the syntax of the AWS States Language. Refer the Step Functions docs on States for details. One can use the AWS Step Function console to start making simple flows (State Machines) using step functions. There are pre-configured examples available to start with. In this article we’ll go through a working example which extracts EXIF metadata from an image, crops the object from image and saves it to s3. We will be assuming that the lambda functions* have already been deployed. I’ll have a blog up about these lambda functions soon. We will use step functions to orchestrate the lambda functions to process the images. Goal : Extract metadata from images, resize image to medium size and a thumbnail. Upload the details to database. A state machine can be created by the AWS CLI or the AWS Step Functions console. Creating it from the console is easier because you can see a visual representation of it. It is also easy to setup the required IAM role to give the state machine permission to the required AWS resources from the console. Open the Step Functions console and create a new state machine with the following JSON. 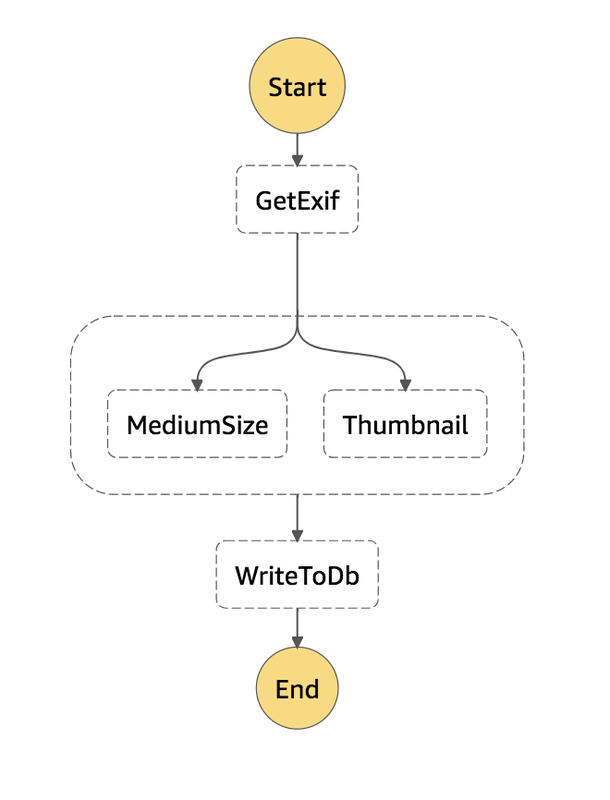 The flow starts at the GetExif state which executes a lambda function to retrieve metadata from the image. Then it executes two image conversion tasks : MediumSize and Thumbnail in parallel. This data is passed to WriteToDb which writes the output to DynamoDB. This is simple example. It is very easy to design more complex workflows with other States available in the States Language. We can also add Error handling and retry functionality to the States. Understanding how to pass data from one state to another is important for building State Machines. The States Language allows us to manipulate and control the JSON data that flows between states. This diagram shows the sequence in which these fields are applied to the JSON data. OutputPath field filters data to be sent to the next state. In this case "OutputPath":"$.messageContent" will send "Hello World!" as input to the next task. Read the Input and Output Processing documentation for more details on this. We can run tests, debug and monitor Step Function executions on the Step Functions console. 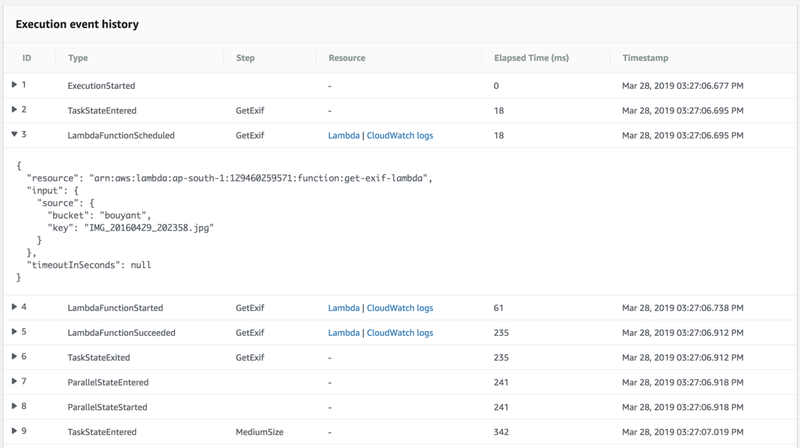 If you are using Lambda functions to run the tasks the logs will be delivered to the Lambda’s CloudWatch log group as usual. Each step of the a particular execution can be viewed for debugging. The CloudWatch logslink redirects to the log stream of that AWS service. It also has a CloudWatch metrics integration to monitor failures in production which are available under CloudWatch > Metrics > States. 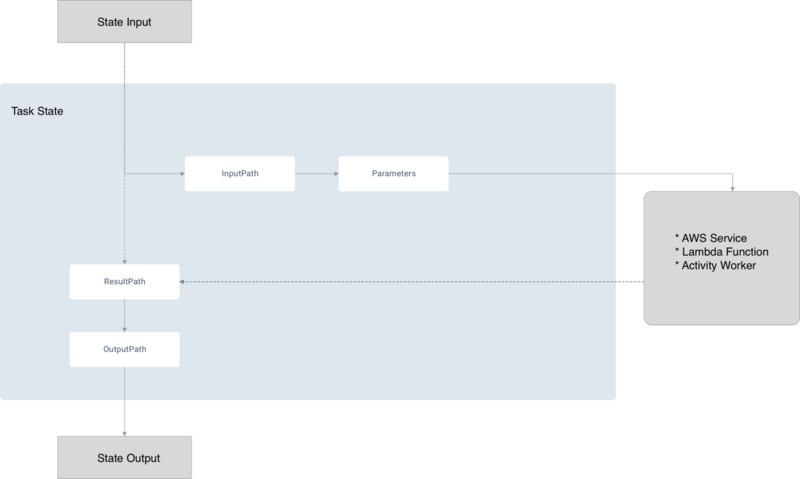 Step Functions is an easy to use service for orchestrating backend workflows. Very complex flows can be designed easily with the States Language. It maintains the state of all the tasks and orchestrate them to run when needed, only when needed and scales automatically. Step Functions is easily pluggable with existing architecture. Since, an SFN can stay alive for 1 year it can also be used for long running workflows using activity worker. Step Functions has probably the coolest console among all the AWS services. Thanks to Sudhir Rao and Mohammed Atif.